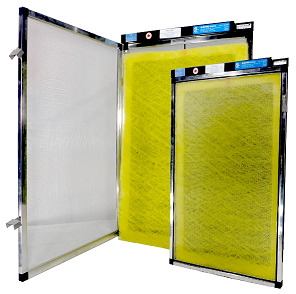 Electro Breeze 1 inch panel to replace your existing low efficiency filter. Just plug it in and turn your furnace into a whole house air purifier. 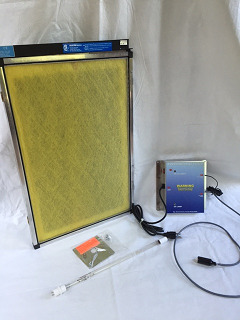 The Electro Breeze air cleaner panel alone is an excellent air purifier for asthma and allergy sufferers. Order replacement UV bulbs or replacement media filter pads here. Efficiency of the Electro Breeze whole house air cleaner system is 97% at 0.3 microns (What is a micron?). To compare, popular Allergen filters only capture 10% at 0.3 microns. Since Americans spend, on average, 90% of their time indoors, this system designed to be an air purifier for asthma sufferers, is the perfect solution for controlling dust and harmful particles. Click here to see the dramatic effects of coupling these high efficiency whole house air cleaner systems with ultra-violet light technology.